Update: 9-27-2017 v1.4.3: - Fixed changelog dates | - Removed check for content on single-download (prevented reviews from displaying if no content) | - Updated CSS for reviews | - Bundled Font Awesome and removed call to CDN ... 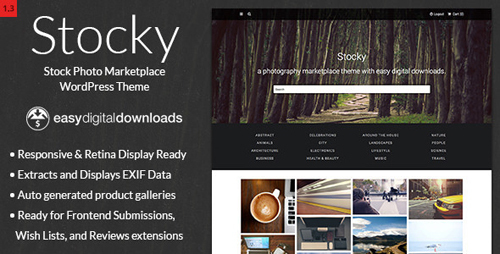 Built on WordPress and�Easy Digital Downloads, Stocky allows you to sell your photos just the same as any giant online marketplace. Not only can you sell your products, but with the available extensions in the�Marketplace Bundle�you can allow anybody to upload their photos and sell through your site. Out of the box along with the�free�Easy Digital Downloads�plugin, your site can run as a stand-alone ecommerce site. But in conjunction with the available paid extensions in the�Marketplace Bundle�you can allow anybody to upload their photos and sell through your site; Turning your site into a full blown marketplace.